Is Jane Doe any closer to being whole during the fourth season of the Blindspot TV show on NBC? As we all know, the Nielsen ratings typically play a big role in determining whether a TV show like Blindspot is cancelled or renewed for season five. Unfortunately, most of us do not live in Nielsen households. Because many viewers feel frustration when their viewing habits and opinions aren’t considered, we’d like to offer you the chance to rate all the Blindspot season four episodes here. An NBC action thriller, Blindspot stars Sullivan Stapleton, Jaimie Alexander, Rob Brown, Audrey Esparza, Ashley Johnson, and Ennis Esmer. After amnesiac “Jane Doe” (Alexander) is found in Times Square, FBI Agent Kurt Weller (Stapleton) and his team work to decipher her intricate tattoos. Despite a web of conspiracy and corruption, they begin to uncover the clues therein, as well as Jane’s identity. As the fourth season of the crime drama kicks off, the FBI team hunts a dangerous enemy operative, and a deadly new foe emerges. What do you think? Which season four episodes of the Blindspot TV series do you rate as wonderful, terrible, or somewhere between? 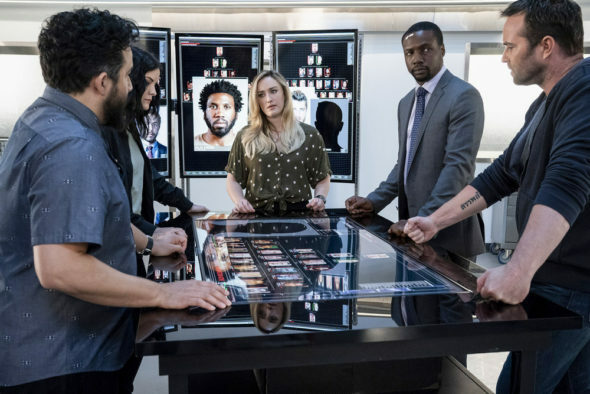 Should NBC cancel or renew Blindspot for a fifth season? Don’t forget to vote, and share your thoughts, below. More about: Blindspot, Blindspot: canceled or renewed? Blindspot: Is the NBC TV Show Cancelled or Renewed for Season Five? Blindspot on NBC: Cancelled or Renewed for Season Four? Absolutely loved this series. It deserves a 5th season, so please renew.